If you are a follower of my blog you know what a fan I am of the classic hairstyles of “Old Hollywood,” reminiscient of Marilyn Monroe, Lauren Bacall, Rita Hayworth, Grace Kelly and so many more. And, I’m sure you’ve noticed we’ve been seeing a comeback of these and other “period” type hairstyles showing up on the red carpet and other big soiree’s where celebrities like to kick it up a notch. As any hairdresser knows, these glamour hairstyles are not so easy to just pull out of your hat! We are simply from a different time where we have different tools and products and our hairstyles have naturally evolved. Our hair styling techniques are different than in the past and hair care products have changed as well. It’s not innate, for even a seasoned hairdresser to instinctively know the right techniques to recreate these looks. However, I would guess that there are an increasing number of clients who have been asking for similar looks from their hairdressers for special occasions . . . am I right? If you have wanted to know more about the craft of creating these “Old Hollywood” or “Period” hairstyles and makeup, check this out. 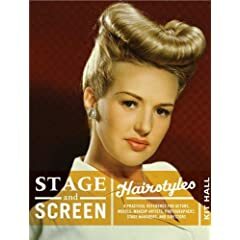 Kit Spencer, a talented hairdresser and makeup artist for television, film, music and fashion, has just released two intriguing books, Stage and Screen Hairstyles , and Stage and Screen Makeup. These are guidebooks that are filled with clear, step-by-step instructions with gorgeous photographs. She has written one book with simple instructions on how to recreate over 100 classic hairstyles and a second book with all the makeup looks for these classic styles! Stage and Screen Hairstyles, is broken down into three sections; Equipment and Techniques, The Gallery, and the Looks. Each historical period is noted up through today. This is a great resource to begin to understand the basics for designing a hairstyle that is authentic. The book is filled with how to’s in recreating leading men’s hairstyles of film and stage as well. Any of you, professional or non professional, who want to add-to and perfect your hairstyling skills or makeup skills, check it out! These books include tons of old period updo’s with loads of tips and practical hairstyling advice.